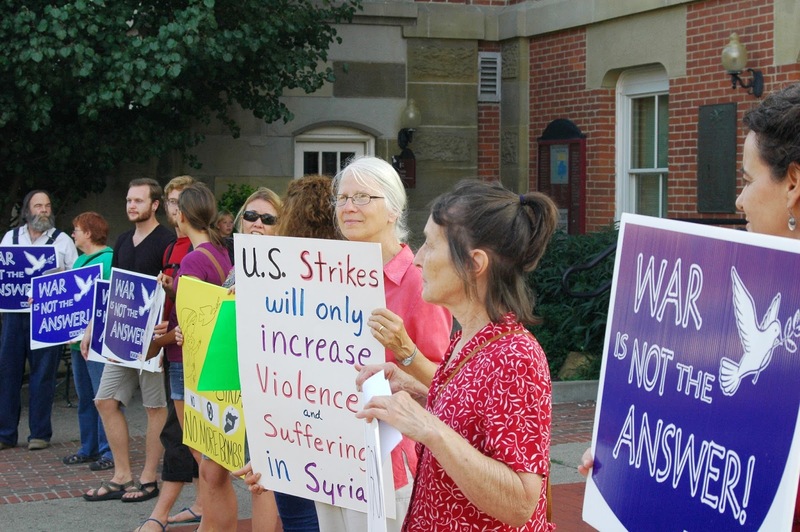 ATHENS – On a warm Friday evening, several dozen Athens County residents gathered at the courthouse on Court Street to protest against any U.S. military strikes against Syria. 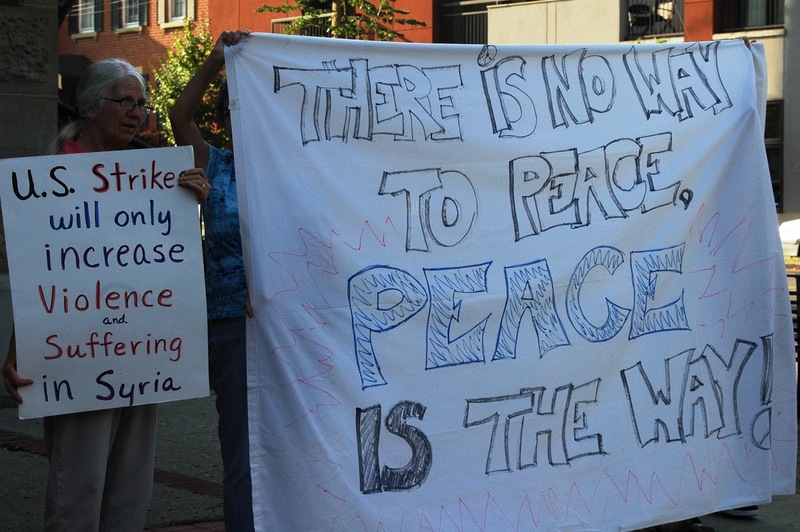 Though the Obama administration has not announced a decision, residents armed with signs and messages of peace are not waiting to oppose to the use of military force. The vigil and demonstration was organized by United Campus Ministries (UCM). Amesville resident Rod Nippert addressed the crowd expressing opposition to military intervention in Syria and pushed the U.S. to hold regional talks and broker a ceasefire between the Syrian government of President Assad and rebel forces opposed to his government. The group is also advocating a prioritization of humanitarian aid and an immediate halt to arms sales to governments throughout the Middle East. Nippert said an estimated 2 million Syrians are homeless or have fled the country, many to neighboring Turkey, Jordan and Lebanon. Protests against attacking Syria have reportedly been breaking out throughout the U.S. as United Nations weapons inspectors examine an area south of Damascus where an estimate 1,000 civilians were killed by a chemical weapons attack. The U.S. and its allies contend the attacks were carried out by military forces under the command of Syrian President Bashar Hafez al-Assad. The Assad government has been engaged in a nearly two-year-long civil war which has left an estimated 100,000 Syrians dead. Assad also serves as Regional Secretary of the Syrian-led branch of the Arab Socialist Ba'ath Party. The country’s population is primarily Sunni Muslim. A United Nations Spokesman said Saturday that, in addition to inspectors, over 1,000 U.N personnel are the ground in Syria providing humanitarian aid through various agencies. Retired Ohio University sociology professor Bob Sheak was at the demonstration saying he has opposed any militaristic foreign policy for decades. Ohio University senior Isaac Placke was one of several students representing Stand Against Genocide. 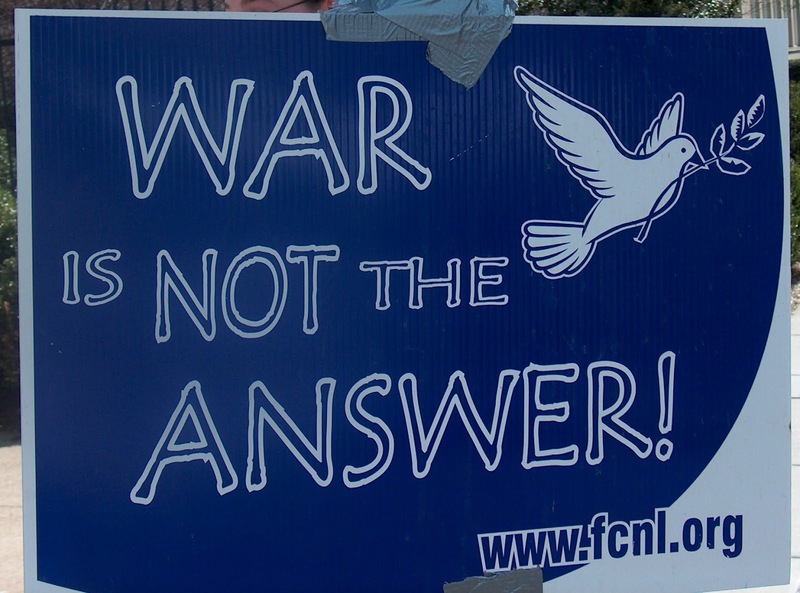 I object to military action anywhere in the world. It’s early in the game for us to be reacting militarily and I don’t think we’ve exhausted diplomatic means, by any means,” Placke said. Student Sarah Volpenhein says Stand Against Genocide is an advocacy group which seeks to raise awareness about atrocities around the world. “We started out focusing on the Democratic Republic of Congo and in recent years we’ve been more focused on the Sudan and Syria. We raise awareness around campus through guest speakers, showing documentary films and we also take action by contacting our state and federal representatives trying to persuade them to take action against atrocities abroad’” Volpenhein said. Sheak feels that President Obama has not presented sufficient evidence that would justify taking military action and placing more innocent Syrians at risk. He says, trust me, and that’s not good enough and I don’t trust him given his support for the military but wants to preserve a status quo. I’m here because I think it will exacerbate the problems and make it worse, with more collateral damage, more death. He should be paying attention to how to put a coalition together to arrive at a solution,” Sheak said. ATHENS – In a Friday media release, Athens County Sheriff Patrick Kelly reported that on Aug. 29, Deputies John Kulchar and Jen Atkins were at a Gun Club Road residence looking for Kenneth Perry Jr. who was wanted on an active arrest warrant. Kelly said Deputy Kulchar noticed what was believed to be marijuana growing at the residence. With a search in hand, the Narcotics Enforcement Team Detective Jim Heater uncovered and seized 6 pounds of marijuana. Items belonging to a child were located in the same room as the marijuana. No one was present at the residence at the time of the search and the case will be sent to the Athens County Grand Jury. ATHENS – United Campus Ministries (UCM) announced it will be holding a vigil and demonstration in opposition to any U.S. military action against Syria. The vigil will be Friday, Aug. 30, 6-7 p.m. at the Athens County Courthouse on Court Street in Uptown Athens. In a Thursday media release, UCM said the demonstration is intended to express opposition to military action against Syria and push the U.S. to hold regional talks and broker a ceasefire between the Syrian government of President Bashar Hafez al-Assad and rebel forces opposed to Assad. The group is also advocating a prioritization of humanitarian aid and an immediate halt to arms sales to governments throughout the Middle East. Participants are asked to bring signs. Sign making material will also be set up in the basement of UCM and community members can are invited to come in throughout the day Thursday until 9 p.m. and Friday from 10 a.m. to 4 p.m. to make up signs. For information contact UCM, 18 N. College St. in Athens, (740) 593-7301. LOGAN – The Southeast Ohio Foodbank and Kitchen is reminding everyone that September is Hunger Action Month. In a Thursday media release the foodbank said more than 50 million people in the U.S. face hunger without a enough fod to put on the table. The 2013 Hunger Action Month theme is “Together, We Can Solve Hunger”. “We all want a better region, where our communities are strong, smart, healthy, and able to put their creativity and intelligence toward our better future. Food is one of our most basic needs. Food is also medicine, energy, community and hope,” said foodbank Director Tracy Galway. Galway said that access to a stable source of nutritious food is such a basic and critical, yet too often missing, component of a healthy life. The 12 Ohio foodbanks, in partnership with their member pantries and other organizations, are working with the Feeding America nationwide network of foodbanks to raise awareness of this critical issue and take action during the month of September, as part of the national Hunger Action Month. Participate in Hunger Action Day and Go Orange. on Sept. 5, signifying the kick off of a month-long effort to raise awareness for hunger-relief. Express your support by wearing orange! Take a picture of you and your business or group in orange and post to the foodbanks Facebook page. Show your support online as well by turning your Facebook and Twitter profile orange; “Like” us on Facebook, stay informed, and share our status updates. 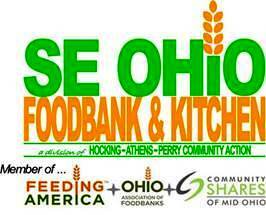 Donate to the Southeast Ohio Foodbank in time and resources. When you support the Foodbank, you are supporting the fight against hunger in our region and the 10 county network of over 60 foodbank member agencies. For every $1 you donate, you provide up to three meals to those in need. Round up your grocery bill at your local Kroger. When you round up at the register, your donation comes directly to the Foodbank! Also, designate the foodbank for Community Rewards on your Kroger Plus Shopper Card. Ask your member of Congress and other elected officials to visit the Foodbank and send a Paper Plate message to them through our Facebook page. Write on a blank paper plate about one of the below questions, then take a picture with their plate and post it on the Facebook page. Why is working together to solve hunger important to you? How does the prevalence of hunger in SE Ohio make you feel? What would you say to others to encourage them to take part in the fight against hunger? Pledge to take the SNAP Challenge and live on just $4.50 a day. Get a sense of what life is like for those struggling to put food on the table by shopping for your meals with the daily average per person benefit provided by the Supplemental Nutrition Assistance Program, formerly known as Food Stamps. Volunteer and stay in touch with us to be an on-going part of the solution to end hunger. Indivuduals, groups and businesses can call (740) 385-6813 for information on volunteer and donation information. ATHENS – In a press release Thursday, Athens County Sheriff announced the passing of K-9 Deputy Turner. Turner was put to rest Thursday after experiencing health issues. Turner was born May 7, 2007 and was a commissioned K-9 deputy with the sheriff’s office teamed up with Deputy Matt Mays for the last four years. ATHENS – Athens County Sheriff Patrick Kelly announced in a Monday media release that deputies recovered 13 pounds of marijuana while executing a search warrant on a River Road residence. According to Kelly, Deputy Jen Atkins was investigating a parking complaint at 13141 River Road, Athens and allegedly detected the odor of marijuana coming from a garage at the residence. Atkins notified her supervisor, Lt. John Morris, and a search warrant was obtained. Detectives Doug Crites and Jim Heater of the Sheriff’s Narcotics Enforcement Team uncovered an indoor marijuana hydroponic growing operation. In addition to the marijuana, scales and $6,320 cash were seized. Arrested were Curtis W. Hinds, 46, of Athens and Kari Labello, 40, of Gallipolis. Both suspects were transported to the Southeastern Ohio Regional Jail in Nelsonville. Hinds is charged with one felony count of cultivation of marijuana, and one felony count of trafficking in marijuana. Labello is charged with one felony count of complicity in the cultivation of marijuana and one felony count of trafficking in marijuana. HAMDEN – At approximately 4:35 p.m. Friday, the Vinton County Sheriff’s Office reported a possible attempted child abduction. The incident occured earlier Friday afternoon in the area of Miller and Wilson avenues. Residents are asked to be on the lookout for a white male with long hair and no facial hair driving a white pickup truck. Anyone with information is asked to call Det. Mike Kemmerling, (740) 596-5242.